This is the internet age, right? You can find anything on the internet. 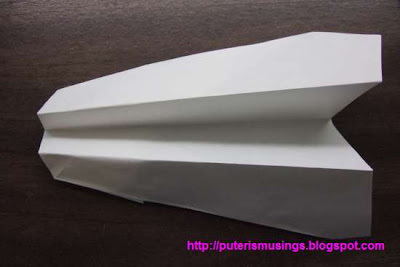 Sure enough there are several sites that teach you how to make paper air planes. I found this paper air plane site based in the UK. It is a very good site, with clear diagrams and video too! You would think with clear diagrams and video tutorials I would be able to make at least one! You thought wrong! Why so "bebal" ("dumb" or close to it in meaning)? I finally found one design that I was able to follow. Only because of the video tutorial! I couldn't make sense out of the diagrams! The design is called Cobra Paper Plane. I think I still have to look at the video again if I were to make another one! :-) It certainly is different from the ones I made as a kid. 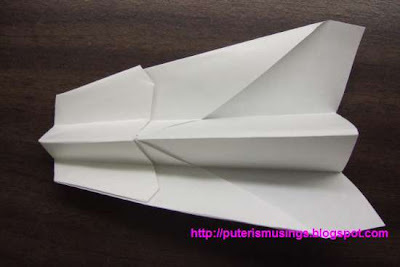 Haha, ni agi ingat nuan chara ngaga paper air planes? Aku bebal amat enda paham diagrams, semadi meda video baru paham mimit!